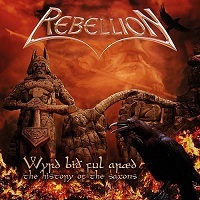 If “New Wave of Teutonic Heavy Metal” were a genre, then REBELLION would be a spearhead. Originally birthed as a project of Tomi Göttlich (bass) and Uwe Lulis (guitar) following their leaving GRAVE DIGGER, REBELLION have been known to create massive and epic metal sagas for albums; not so long ago did they finish a trilogy about Vikings. Hopefully having finally settled on a stable lineup, their 2015 release, titled “Wyrd Bið Ful Aræd – The History Of The Saxons”, is about… Saxons. It contains smatterings of ACCEPT, DESTRUCTION, BROCAS HELM and even some classic ICED EARTH vibes, and running with 12 tracks, it’s no small undertaking. As with any band with an established career, one is likely to judge or otherwise compare, the next release in the context of their previous work. If you were to ask me, the entire “Vikings” saga is the band’s paramount collection of material, particularly the 2009 release, Volume III of said saga: “Arise From Ginnungagap To Ragnarok”. At least in terms of lineup, the band was a different collective back then, and the music was treading Epic Heavy Metal territories, with compositions that were both soaring and crushing. The modern material is arguably includes the heaviest they have ever released, polished off with their cleanest production to date, but I was not floored quite as fast as with “Arise…”. Take the opening track for instance; “Irminsul” opens with a decisive series of chugga-chug riffs and ripping leads and a deceptively catchy chorus, but listening further down the tracklist begins to imply that it could be the album’s weakest track. I didn’t pick it up nearly as much as with subsequent tracks, but the sound of the kick drums made it somewhat hard for me to take the track seriously; verging on obnoxious, they are kept very high in the mix and permeate through the arrangement like a stubborn pimple. Unfortunate, since aside from that, I was comfortably getting into an accessibly opener. Luckily, the majority of my qualms of the album were left behind as I reached the next few tracks. “Gods Of Mercy” takes a far darker and bombastic route along a comparatively dirge-like march, with Michael’s vocals displaying considerably more range. “Sahsnotas” does successfully what the opening track was meant to accomplish in terms of an aggressive mid-tempo attack, but also contains a range of tempo and mood changes, like the ebb and flow of clashing armies over the course of a lengthy battle. To pick a favourite would be to side with “Runes Of Victory”; I can’t think of another track on the record that comes as close to perfection as this number. From the memorable opening leads to the powerful chorus, this track bleeds the album’s message: what it is to be Saxon. “The Killing Goes On” contains the fastest riffs on the record, the band showing their traditional Speed/Heavy influences bleeding through. Michael’s vocals snarling over drums that run like cannonfire turn this into the album’s powerhouse. Does it hold a candle to the finale of the “Vikings” saga? One with a short wick; does it contain some truly stellar tracks that hold a testament to the band’s relevancy and stature within the indomitable German Metal scene? Absolutely. Not their best release, if you’re looking for sprawling epics, but certainly a piece to be proud of.